Fairytale motifs are not like cabinetry handles or splashbacks – they don’t date! Images like mirrors, woods, keys, glass slippers, kisses are classic symbols that have endured the test of time and are still full of meaning today. A couple of months ago I posted about some modern versions of fairy tales – today I have a beautiful collection of fairy tales to share. I think it’s important that kids grow up with an appreciation for classic fairy tales – not just the Disney cartoon type. Give them the classics first, then show them the spin-offs! The fairytale princess, seven classic stories from the enchanted forest, retold by Wendy Jones and illustrated by Su Blackwell would make a beautiful book for any kid. I have to admit, Miss 9 loves this book more than her brothers do – it does have the word ‘princess’ in it. The stories are simply told, and you can easily read one or two before bedtime. The language isn’t too convoluted or formal but still has the beauty and elegance of stories from long ago. Perfect for three to ninety-three year-olds. But it is the illustrations that make this book amazing. I don’t usually post too many photos but this book needs to be shown and shared! 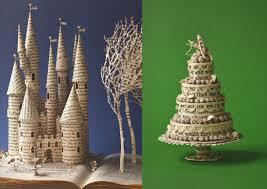 The illustrations are made from the pages of old books, cut and torn and twisted and pleated and wrapped to make gorgeous sculptures and collage. One day, I am going to do a course to learn how to do this. You can listen to Su Blackwell reading Cinderella and see the illustrations at this little video here.